ST GEORGE — Sometime over the previous weekend, someone broke into Nielson RV’s liquidation lot and stole several pieces of high-end electronic equipment. The company is offering a reward for any information leading to the arrest and conviction of those involved. Owner Scott Nielson estimated the thieves got away with at least $5,000 worth of equipment, though that amount could rise as they examine inventory. 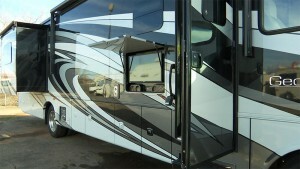 “We’re finding more as we keep going through the RVs and the trailers,” Nielson noted. The thieves appeared to target specific equipment. Missing items include amplifiers, flat screen TVs, subwoofers, stereos and sound bars, as well as particularly expensive backup cameras. “The four-inch kicker speakers-subwoofers are very valuable, so we suspect it’s kids or people that are reselling them online,” Nielson said. 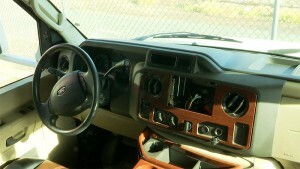 Nielson RV has filed a report with St. George Police and authorities are actively investigating the theft. The thieves apparently entered the recreational vehicles through the passenger window, in one case leaving behind a footprint that police are analyzing. “It’s really difficult being in business, especially here in southern Utah trying to make a living with the expenses and the overhead, and to have something like this happen, it makes it all the worse,” Nielson said. Nielson RV has been in operation for over 15 years at its Hurricane location, and it recently expanded to include a brand new lot in St. George. Its liquidation center, where the thefts took place, is located at 150 E. 1060 South in St. George. Anyone with information about the theft is encouraged to call Nielson RV at 435-635-5036 and St. George Police dispatch at 435-627-4300.